Long Island’s 2001 vintage was remarkable mostly for how it ended. For Kareem Massoud, it was memorable as the year he started to make wines at Paumanok Vineyards, his family’s winery. He remembers the late-season weather too. “I remember standing out in the vineyard in December. It was in the 70s and it just seemed remarkable,” he said during a recent tasting at the Aquebogue vineyard. For me, the 2001 vintage is memorable because its red wines were on the market when I first started writing about Long Island wine. It was the vintage that showed me Long Island’s potential and made me fall in love with the region. I’ve had a case or so of 2001 local reds stashed in my cellar for many years, waiting for a reason to taste them. This story is that excuse. I invited a small group of vintners, including Roth and Massoud, as well as Raphael/Anthony Nappa Wines winemaker Anthony Nappa to taste the wines with me. 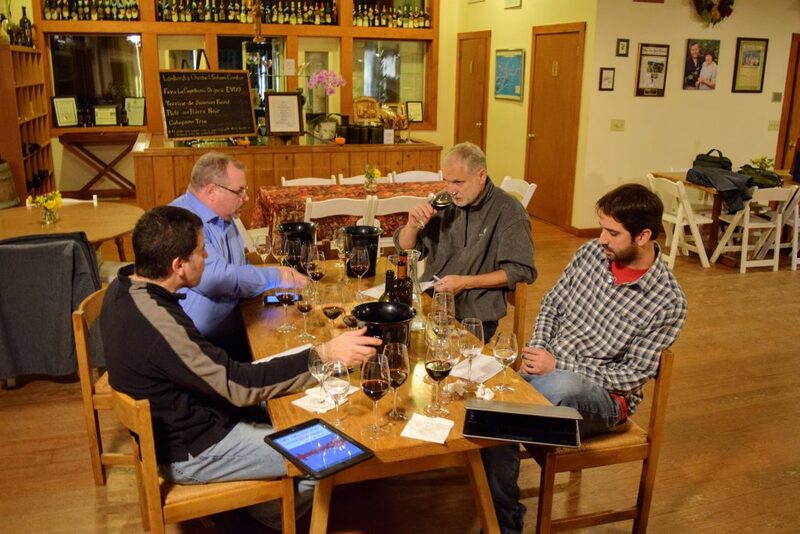 We tasted through wines from some of Long Island’s longest-tenured wineries — Paumanok, Wolffer, Pindar and Castello di Borghese, as well as those from wineries that have since closed, like Peconic Bay Winery and Ternhaven Cellars — we covered a lot of ground in just a couple hours. 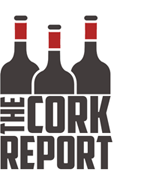 We talked methoxypyrazines (a compound that gives underripe grapes a bell pepper flavor) and how customers buy and store wine and winemakers who are no longer in the region. The tasting left little doubt that Long Island red wines can age beautifully, taking on more pronounced earthy and herbal qualities that span the spectrum of aromas and flavors. This wasn’t news for us. We’d each tasted enough aged Long Island wines over the years and been impressed, and proud, of their development. But even I was a bit surprised at how many of the wines had not only held up, but improved over time. It’s a key point that sometimes gets lost. Of the nearly 20 bottles we sampled — varietal merlots, varietal cabernet sauvignons and red blends — there were only a couple of wines that I wouldn’t drink. Everything else was pretty delicious, with surprisingly few on the decline. I asked the group what time frame they consider relevant when it comes to whether or not a wine is age-worthy. Answers varied a bit, but 15 to 20 years seems to be the target. And while most consumers (up to 99% according to one winemaker) don’t age wines longer than a week or two, that an area’s wines can age gracefully for 5, 10 or 20 years is important to the region. It proves to collectors — and notoriously snobby and finicky bunch — that Long Island makes serious wines. The other standout cabernet, Laurel Lake Vineyards 2001 Reserve Cabernet Sauvignon, was a bit of a surprise. Though the winery isn’t often listed among Long Island’s top tier, the wine was long and lean. The mid-palate fruit had a subtle jamminess to it and it tasted unlike any mature cabernet sauvignon, or wine, that I’ve tasted from Long Island. On the whole, more of the merlots were further along in their development, with several past their prime drinking window. Still, three merlots bucked that trend in a big way. 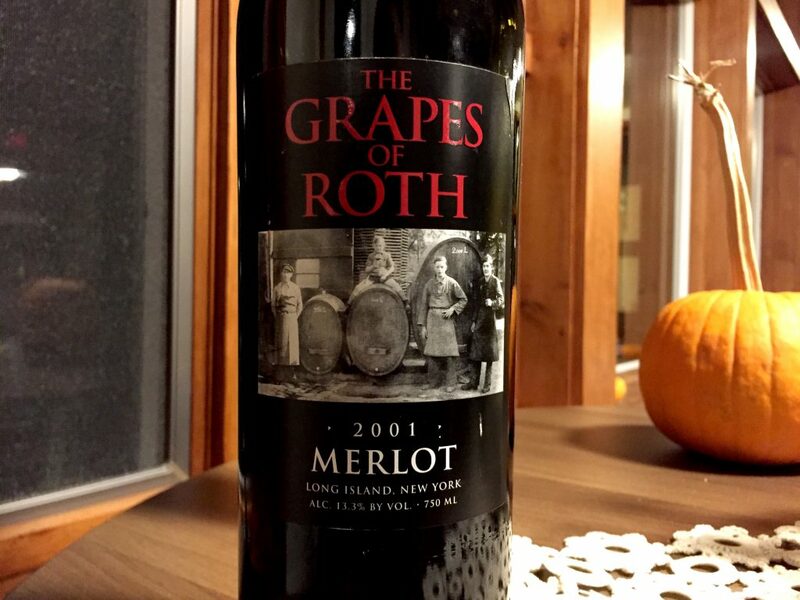 Grapes of Roth 2001 Merlot, made by Roth with fruit grown at Martha Clara Vineyards, showed amazing structure and acidity with plenty of ripe youthful fruit balanced by sweet oak flavors and a long, elegant finish. Tasting it made me glad that I have another bottle in my cellar. 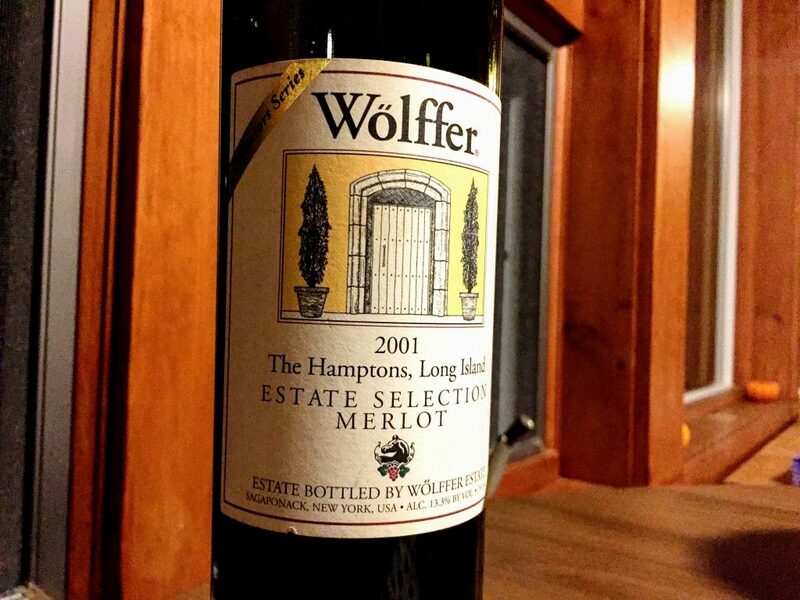 Wölffer Estate Vineyards 2001 Estate Selection Merlot by comparison tasted a bit more mature and more elegant. Decidedly lighter on its feet, there was still a ripeness to the fruit character, but a distinct minerally-graphite note and a long, silky finish. Massoud compared it to Right Bank Bordeaux. 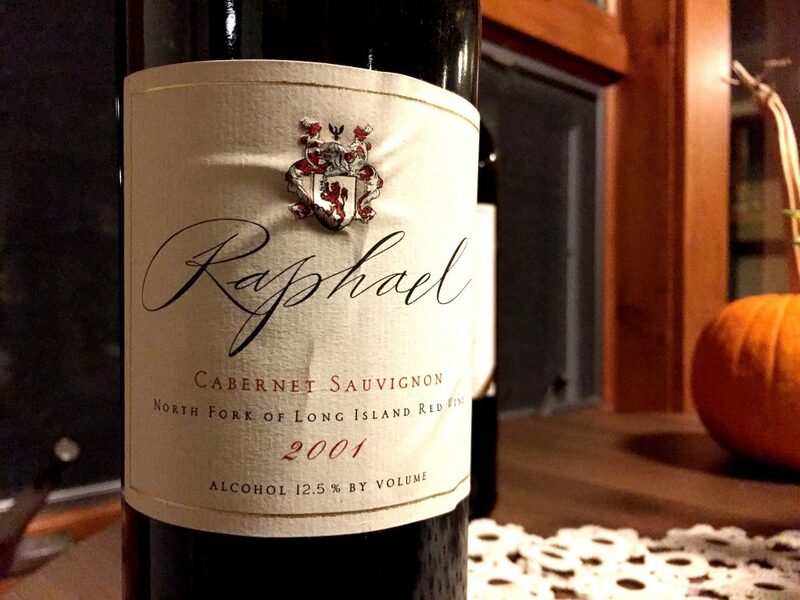 And while it didn’t have a lot of fruit flavor left, Raphael 2001 First Label Merlot, again made by Olsen-Harbich, also reminded me of nicely aged Bordeaux with its earthy flavors of mushroom and peat moss and still-grippy tannins. These wines aren’t widely available, but many wineries do have small allotments of library wines available for sale in their tasting rooms. Ask the next time that you visit your favorite winery. They don’t come cheap, but the rare opportunity to taste a well-stored, maturing Long Island wine is worth the splurge. This article came at a great time … While preparing to move from LI to Texas I reviewed the wines in my cellar which have been maintained and turned over the years in their rack. I came across my aged LI wines and was curious how they would hold up. Seem you did same recently. I have a similar variety and vintage with a few ’01 as well. They are Laurel Lake, Borghese, Wolfer, and mostly Raphael as I was a member back then (some still the in the tissue paper they wrapped their better wines in). Do you think I should start drinking or can I let them go longer? More importantly does a second hand resale market for these wines exist??? Id post a picture if I could.